Today I sit in my caged existence away from the outside world and still connected to the revolutionary community. 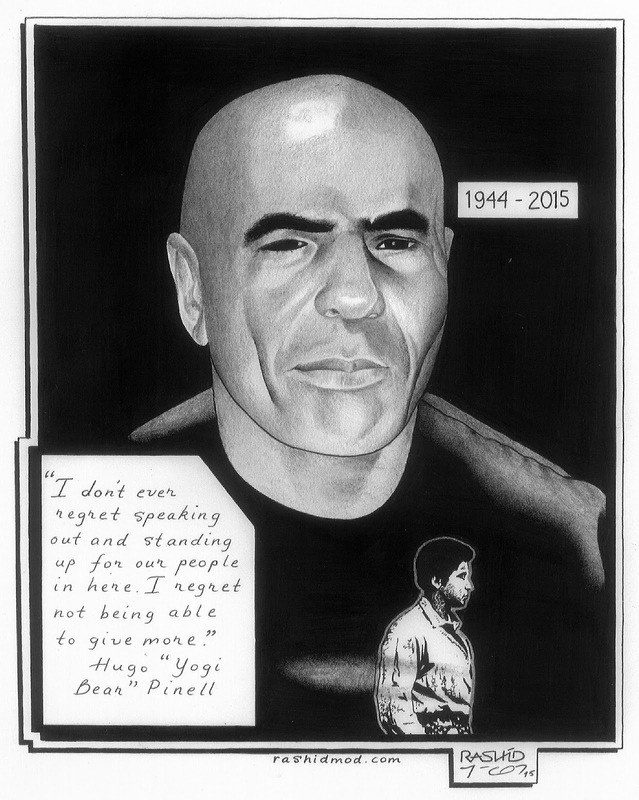 Recently a New Afrikan brother and comrade wrote me with news: Hugo Pinell was executed on the prison yard at Folsom. This was heartbreaking news and it sent me into a rage. I was introduced to our brother Yogi over 15 years ago when he exchanged correspondence about the struggle and survival on the inside. He gave me a political overview of his contribution to our movement, inside and outside of these plantations. Hugo Pinell, like George Jackson, was and shall ever be an example for New Afrikan manhood. He expressed his solidarity with our prison activism and our collective responsibility to create change. Hugo Pinell equally supported my fight for freedom from a charge I spent 20 years in solitary confinement over. A prison guard was stabbed to death and after a trial and being found guilty, I was sentenced to 60 years. Hugo Pinell, like George Jackson, was and shall ever be an example for New Afrikan manhood. Hugo spent over four decades in solitary confinement. Those repressive conditions didn’t break him, and for years he represented a symbol of revolutionary love and strength. He was a teacher, big brother and fighter in the cause of our people. His legacy must be held up and celebrated in the same likeness as we honor George Jackson. This brother will be missed by many – let us rejoice in what he was to us – and his life and his memory shall live in our nation in his death. To hear that at 71 years old he was stabbed and killed by an affiliated white supremacist after being released from solitary confinement (hell) affected me terribly, and his executioners should never know again what it feels like to rest at night. I pray to Allah that he torment their very existence. For Hugo “Yogi” Pinell was and will forever be a chosen son of the freedom struggle for a liberated New Afrikan nation in Amerikkka. His legacy must be held up and celebrated in the same likeness as we honor George Jackson. Hugo inspired me to keep on standing for a self-determined free liberated zone for our people. I will not let my big brother down. Long live Hugo Yogi Pinell! A luta continua. I am sharing a poem for our brother going home. Send our brother some love and light: Khalfani Malik Khaldun (L. McQuay), 874304, P-203, P.O. Box 1111, Carlisle, IN 47838.